1. 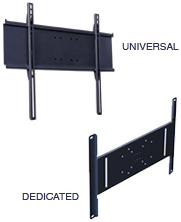 Dedicated adapter bracket used with various styles of plasma or LCD mounts. 2. Includes mounting hardware to attach adapter bracket to plasma. 3. Finish is scratch resistant black fused epoxy.